Like the Capeweed, the Mayweed Sunray (Hyalosperma cotula) is a member of the Asteracea family with its multiple flower disc floret, but this one is native to Australia. The flower is much smaller at only 20mm across. 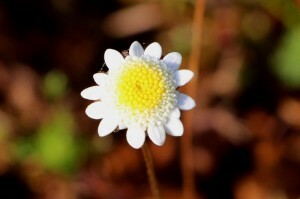 We have a lot of these growing particularly on the firebreak and at the edge of the forest.